SSL certificates ensure that your website can be accessed in a secure way. If there is exchange of sensitive data between your website and its visitors, it is advised to use SSL on your website. RapidSSL is an industry standard 128/256 bit SSL certificate, and an ideal choice for securing new, small and medium-sized businesses. It is an affordable, domain-validated certificate and is usually issued within minutes to protect transactions 24/7. Strong 128/256 bit encryption, industry standard SSL. RapidSSL Certificates: recognized by 99+% of browsers. 30 days to try out RapidSSL. 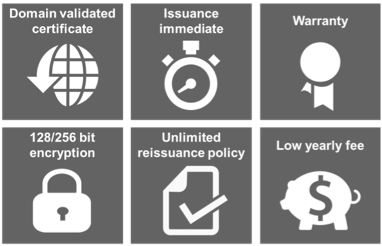 $10,000 warranty protects against mis-issuance. I cannot login to our control panel. The following error message appears: "The underlying connection was closed: Could not establish trust relationship for the SSL/TLS secure channel". Most probably your SSL Certificate is expired, and needs to be renewed. Please contact our Support team (see how through the following link http://luxcloud.com/help-support/).